At the Honnehokke Resort (previously know as Die Hondehok Chalets), we have several comfortable and tranquil self-catering chalets (known as Kennels) available to suit your every need. Every Kennel has its own kitchen and bathroom and every kennel has its own braai. Whether you're travelling with your family, friends or on your own, our chalets will make you feel at home the moment you put your foot in the door. 1 x queen bed, 4 x single beds (one bunk bed) and one bathroom in the main bedroom, kitchen and outside braai. 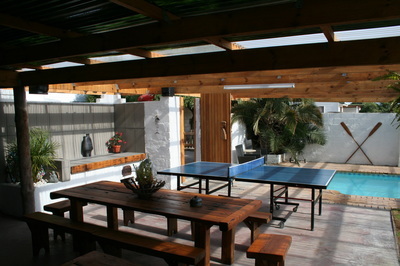 R750.00 per night. 1 x En-suite bedroom with a queen size bed and two single beds with bathroom. Plus en-suite studio with galley kitchen and two single beds with bathroom. Outdoor braai. 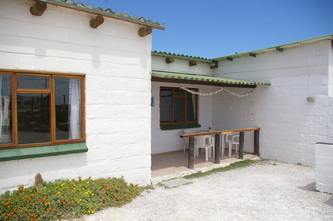 R850.00 per night. 1 x En-suite room with a queen size bed and two single beds with bathroom). Plus en-suite studio with galley kitchen and two single beds with bathroom and kitchen). Outdoor braai. R850.00 per night. Double bed, bathroom and kitchen with an outdoor braai. Plus 1 single bed/couch. R700.00 per night. Double bed, lounge, bathroom and kitchen with an outdoor braai. R700.00 per night. Double sleeper couch in kitchen area. To enquire about availability, please visit our contact page or send an email to nel.esme@gmail.com or honnehokke.chalets@gmail.com. You can also contact us directly at 082 564 5471. Please note that we only take bookings for 4 days or more over the December holidays.